Aged skin looks refreshed after our laser resurfacing treatments. Serrão Rejuvenation Center, led by Dr. John Serrão, a board certified gynecologist who specializes in anti-aging medicine and non-surgical rejuvenation of the face and neck, offers laser resurfacing for women in Orlando, Winter Park, and the surrounding areas of Florida. Our team of facial and body rejuvenation specialists will provide you skilled, quality care so that you can see the best results possible. The reason that your skin looks aged and dull is that the layers have been damaged, either by sun exposure or the natural aging process. These factors break down substances that keep skin healthy and radiant. By removing the damaged layers, we reveal younger, healthier cells. Technologies that are used for laser resurfacing are categorized as ablative and non-ablative. Ablative means that the outer layer of skin is removed. Non-ablative treatments use other mechanisms, such as subdermal tissue heating to rejuvenate the skin. Serrão Rejuvenation Center stands out from other cosmetic treatment practices because we make every effort to give our patients the exceptional, personalized care that they deserve. Dr. Serrão considers patient downtime and healing when recommending treatments, and he begins with the most conservative approach. He openly shares his expertise and professional insight so that patients feel empowered to make informed decisions about their procedures. If you are considering surgery to look younger, we invite you to learn about laser resurfacing treatments. Dr. Serrão values taking the most conservative approach first. Many of today’s cosmetic technologies provide outstanding results without the lengthy recovery process that is required with surgery. You simply spend less time healing and more time enjoying the benefits of our laser resurfacing treatments. Laser resurfacing is beneficial at any age. Serrão Rejuvenation Center, led by Dr. John Serrão, a board certified gynecologist who specializes in anti-aging medicine and non-surgical rejuvenation of the face and neck, offers laser resurfacing for women in Orlando, Winter Park, and the surrounding areas of Florida. To learn more, contact us to schedule a consultation, meet our team of MedSpa providers, and begin your rejuvenation today. Aged skin looks refreshed after our laser resurfacing treatments. Serrão Rejuvenation Center, led by Dr. John Serrão, a board certified gynecologist who specializes in anti-aging medicine, offers laser resurfacing for women in Orlando, Winter Park, and the surrounding areas of Florida. Our team of facial and body rejuvenation specialists will provide you skilled, quality care so that you can see the best results possible. Laser resurfacing is beneficial at any age. Serrão Rejuvenation Center, led by Dr. John Serrão, a board certified gynecologist who specializes in anti-aging medicine, offers laser resurfacing for women in Orlando, Winter Park, and the surrounding areas of Florida. To learn more, contact us to schedule a consultation, meet our team of MedSpa providers, and begin your rejuvenation today. Why is the CO2 Laser Resurfacing technique the best? The CO2 laser is considered the standard for laser resurfacing. Used for years to remove the aging outer layer of the skin to allow the inner skin tissue to regenerate, it successfully helps form newer, smoother and more youthful appearing skin. It effectively stimulates new collagen growth in the deeper skin layer, improves the damage caused by the sun, plumps the skin, removes unwanted pigmentations, smooths wrinkles, improves acne scars, and tightens the skin. Thus, essentially almost all the changes of aging can be treated with this amazing new laser technology. However, some conditions like melasma and stretch marks may benefit more from non-ablative resurfacing. What is the recovery from Laser Resurfacing? The ablative type of laser resurfacing. Thus, because it destroys the superficial layer of skin cells, it has more downtime than the nonablative techniques. However, it produces far superior results. The best part of this story is that relative to the older CO2 laser resurfacing techniques, this fractionated CO2 laser results in much less downtime. Most people are able to go back to normal work and activities within a few days to a week, depending on the depth of the treatment. This is about a third of the healing time required with older traditional laser resurfacing. The non-ablative type of laser resurfacing requires less downtime leaving your skin feeling like a sunburn for about an hour followed by minimal discomfort. The skin may be red and swollen for 24 to 72 hours. As the skin is healing it may have a pinkish tone which may last 5 to 7 days. Generally, your skin will continue to improve as the collagen regenerates for up to 6 months. The recovery of these procedures and all of your post care will be explained to you during your consultation. How is the Laser Resurfacing done? The procedure is performed in the office using only local analgesics with mild sedation as needed. Numbing cream and/or regional blocks can be utilized to make the procedure comfortable. It takes only around an hour to do the whole process. Afterwards, most patients complain of just mild discomfort treated with pain medications. The entire procedure will be explained to you during your consultation. Can other procedures be done at the same time? Laser resurfacing can be combined with other facial rejuvenating techniques to give you the best results with the least downtime. Botox can help eliminate wrinkles that form in the upper face and around the eyes from dynamic muscle contractions. Facial fillers, such as Juvederm, Radiesse and Sculptra can replenish the volume that is lost as you get older. IPL Photofacial treatments can fade and decrease the age-spots, sun spots and facial vessels to enhance the effect of the laser resurfacing on these changes. Combining these options can enhance the results of laser resurfacing to rejuvenate your face even more. Are people happy about their Laser Resurfacing results? Most people are very glad they had Laser Resurfacing performed. Their face is smoother with less wrinkles, lines, and pigmentations. They exhibit a more youthful appearance. Plus, they were able to do this without going under the knife and getting a face lift. Although the procedure does not replace a face lift, it does produce dramatic results by tightening and smoothing the skin. 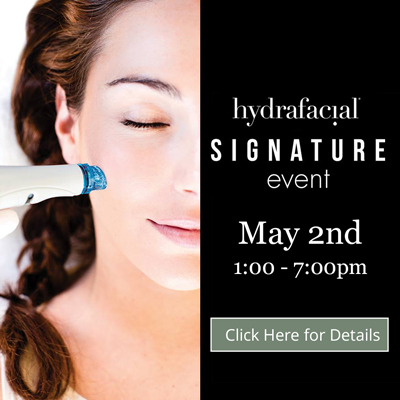 It is a nonsurgical option to rejuvenate your face. Non surgical cosmetic enhancement procedures are improving every day. These minimal downtime procedures are replacing the need to perform plastic and reconstructive surgery on the face. Plastic surgery is becoming non-surgical. We have always and will continue to practice on the cutting edge of new facial rejuvenation techniques. You are always able to get the latest up to date treatments at our facility, Serrão Rejuvenation Center. How can I find out if I’m a candidate? To find out more about this procedure, call us to set up a consultation. 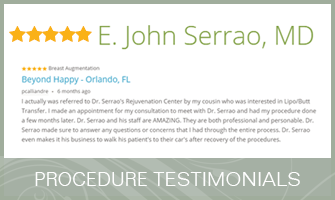 Dr. John Serrão performs Laser Resurfacing for patients in the Orlando Central Florida area. Call us at 407-896-3772 to schedule your consultation.